Making Schools Work Conference sessions focus on transforming teaching and learning in every discipline, at every level – from K-12 through postsecondary education. Promising practice sessions (60 minutes) highlight powerful practices and pedagogies that transform teaching and learning in any disciplinary area and in any setting — including elementary schools, middle grades schools, high schools, shared-time or full-time technology centers and postsecondary institutions. 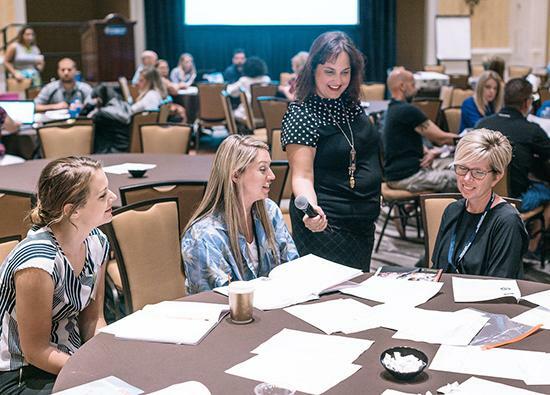 Deep-dive sessions (120 minutes) give school teams time to explore a problem of practice in their K-12 school, technology center or postsecondary institution and partner with other educators to develop tools, strategies and plans to address that problem. Table talk sessions (25 minutes) allow presenters and attendees to share and gather information about top-of-mind issues related to conference objectives in an informal setting. Table talks can be mini versions of promising practice or deep-dive sessions or stand-alone sessions about key problems of practice and top-of-mind issues related to conference objectives. Flash talk sessions are an ideal way for presenters to share key facts about promising practices or pedagogies in their schools or classrooms in seven minutes or less, with three minutes for questions. Held on a conference ballroom stage, flash talks will be filmed and shared on the web and social media. All conference sessions will be held in the Hilton Baltimore or the Baltimore Convention Center. 1. Engage each student in every classroom through high-quality instruction. Integrate literacy-based assignments in all content areas. Implement powerful mathematics practices that build students’ mathematical fluency, reasoning and problem-solving skills. Embed rich science, technology, engineering and mathematics learning experiences at all grade levels. Employ project- or problem-based instructional strategies that engage students in solving real-world problems. Use technology to support quality instruction. Provide opportunities for academic and career and technical education teachers to collaborate. Adopt flexible grading strategies that encourage student persistence. 2. Ensure each student has access to curricula that align with grade-level readiness standards. Align assignments and assessments with readiness standards. Engage teacher-teams in vertically aligning standards and curricula across the elementary grades, middle grades, high schools and technology centers. Implement curricula that lead to existing and emerging high-skill, high-wage, high-demand careers. Use assessment data to identify curricular gaps. 3. Offer each student access to career pathways and programs of study that align with student interests and good jobs. Align programs of study and career pathways with workforce needs. Engage business and community partners in developing and evaluating programs of study and career pathways. Market programs of study and career pathways to nontraditional students and students from diverse racial, ethnic and socioeconomic backgrounds. Increase opportunities for students to take dual credit or dual enrollment courses. Work with business and community partners to expand access to developmentally appropriate, structured work-based learning experiences that build students’ academic, technical and employability skills. Develop and implement career academies that allow students to take academic and CTE courses as a cohort. 4. Provide each student with appropriate supports to graduate ready for college and careers. Implement an early warning system for students who do not meet grade-level readiness standards or are not on track to graduate. Employ a system of tiered interventions for students who need academic, social, emotional or behavioral supports or are struggling with the effects of poverty or trauma. Provide each student with developmentally appropriate career and college exploration and counseling, starting in the middle grades. Identify students who need additional supports or readiness courses to transition successfully from the elementary grades to the middle grades, from the middle grades to high school, and from high school to postsecondary education and the workplace. Commit to equity for each student as a means of addressing several issues (poverty, learning disabilities, biases, etc.). Redesign the senior year to allow college-ready students to gain a head start on a postsecondary credential or degree and help students who do not meet readiness benchmarks to enter postsecondary programs without the need for remediation. 5. Establish systems and processes that promote a culture of continuous improvement. Create schedules and structures that engage teachers, counselors and school leaders in collectively identifying problems of practice and finding research-based solutions to those problems. Use data to make effective decisions and monitor progress toward bold goals and objectives. Provide teachers, counselors and school leaders with ongoing professional development that builds their capacity to deliver high-quality learning experiences. Build leadership capacity within the school and the district. Develop systems and processes for managing change. Engage parents and communities in owning school successes and challenges. Leverage funding streams to support quality curricula and instruction.